As a guide to the Traditional Latin Mass, the St. Benedict Tridentine Catholic Community has developed a set of handouts containing the Propers, or changing parts of the Mass, along with the music and announcements for the week. Both the original Latin and English translations are provided, to help you follow the Sacred Liturgy. PDF versions of these Propers Handouts are posted below, covering the Sundays and major feasts of the year. They are sized to print on legal-size paper, folded in half. You may find these to be helpful in preparing for Holy Mass. The Red Missals available at the back of the church contain the Ordinary, or unchanging parts of the Mass. Together with the Blue Hymnals which contain most of the hymns and Mass parts that the congregation sings, these resources help you to follow and participate in the Holy Mass. You do not need to know Latin; English is alongside the Latin. The Red Missals also contain pictures and explanations in the margins to help you understand what the priest is doing at the altar. 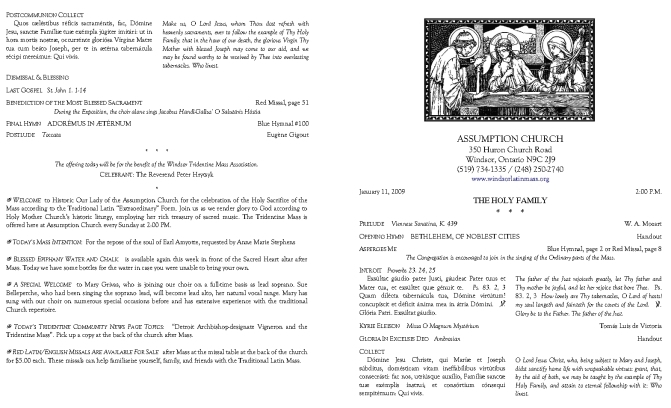 Large-font English Readings Sheets for use in the pulpit have also been posted here for use by the priest. Additional handouts will be posted here as more are created. Please e-mail info@windsorlatinmass.org or call (248) 250-2740 for further information.